Start filling the upper chamber with water. 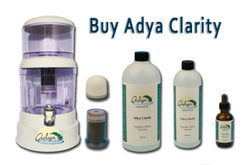 While filling, add the appropriate amount of Adya Water Purifying Solution to the water. The water will filter through the Micro Ceramic Filter and 4-Layer Earth Filter into the bottom chamber and be ready to drink in a short while. Enjoy! 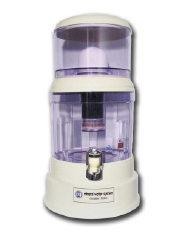 Upper Chamber: Simply remove the upper portion of your water system, unscrew and remove the ceramic filter. Wash the inside and outside of the upper chamber with a non-abrasive sponge. Clean with a mild detergent and rinse well. Lower Chamber: Once the upper chamber is removed, remove the plate which has the 4-Layer Earth Filter attached. Remove the chamber from pedestal and follow the same process as the upper chamber. Spigot: Simply hold the spigot in place with one hand and unscrew the inside portion. Rinse well with hot water. Gently wash with a tiny brush if you like.